All parts that needed some kind of curvature were supplied factory bent in the kit. A good and thoughtful thing for modellers who lack the experience and/or tooling to bend the parts themselves. Good reading on this subject is Iain Rice's book "Etched Loco Construction". You will find that bending and rolling rarely needs expensive equipment! This is the original part from Philotrain un upside-down position to show the shallow curving of the water tank's sides and the etched beading. Even three corners had been bent to 90 degrees. The only thing the modeller was supposed to do, so was the theory of the supplier, was soldering the fourth corner and soldering the lot to the bottom of the footplate. BUT....this loco never had three steps below the door of the driver's cab, just one. Moreover, these steps were distinctly on the wrong place, too much to the rear of the locomotive oddly displaced form the door. The same applies to the two steps in the front. Just one was needed on another place. I delved deep into my available photo's and I never came across any picture showing this arrangement. There were other tram locomotives that did have this arrangement but they were of a clearly other design than LTM 21-30. While studying my own photo's from SHM 26 I noticed two other differences. And what to think of this. The front and back skirts did not only differ in size but also in shape. The good thing about it was the general size and this etching in the middle. I wanted to retain that. 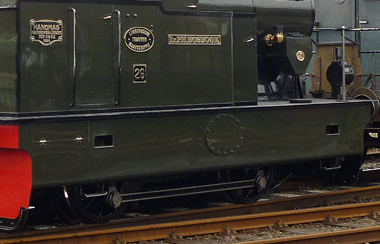 ... and at the left the watertanks appear from under the footplate by almost a millimeter. As the water tanks should line up with de bunkers and the cab on top of the footplate, this means that the water tanks assy is about 2 mm too wide!! That was spark that lit up the modelling fire. Then I rolled the water tanks's side with a steel bar to flatten it. The curl was uncurled by gently rolling on the other side and by hand bending. The steel bar buy the way is a large nail with its head cut off. Cheap and effective bending tool. and after that I tested my nerves on the the first water tank. That went well and I repeated the whole party for the second water tank. One complete turn is one millimeter,one large line is 0.1 mm and between any line is half a millimeter which you easily mentally divide in fours which is about 0.0125 mm!! The swinging of the 0.8 mm drill is more than that. The hole were connected with a jeweler's saw and filed to form.